Hartman, author of The Lean Farm and The Lean Farm Guide to Growing Vegetables, will explain powerful concepts from the Japanese lean system that prevent burnout and increase profits with less waste and work. The workshop is geared toward market gardeners, covering lots of production techniques and tips. However, Lean Farm principles are applicable to all farms, not just market gardens! The lean system is universal and the workshop will focus on efficiency techniques that farmers of any size and type can take home and immediately employ. 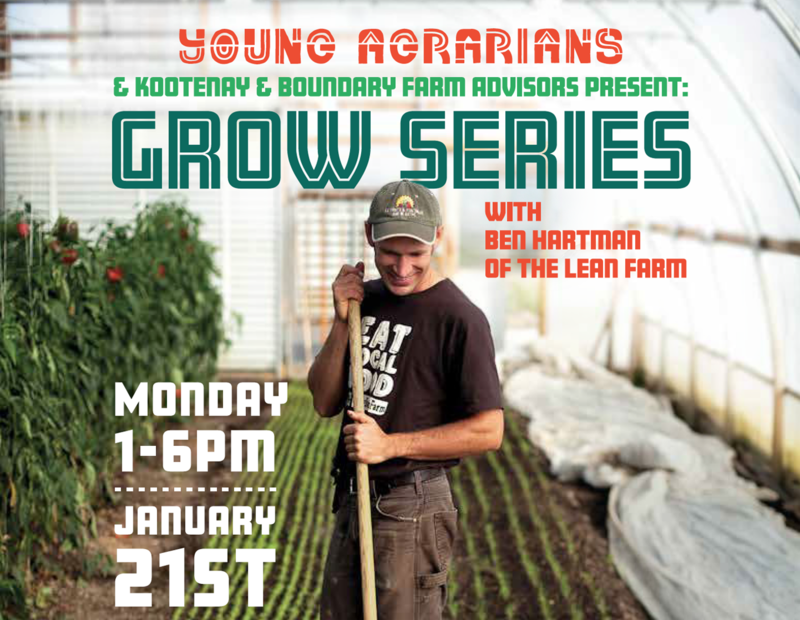 Ben will provide examples of lean at work on Clay Bottom Farm, in northern Indiana, where he and his wife earn a comfortable living from 1/2 acre of cultivated land working less than 35 hours per week. Bring your friends on January 21st and let’s learn, celebrate and support the development of local agriculture in the Columbia Basin! Need a ride? Have space in your car? Post on the Facebook event page and carpool to the event. Young Agrarians, in partnership with FarmFolk CityFolk, is a farmer2farmer network for new and young food growers in Canada. Young farmers in Canada have been on the decline since 1991, with a first recent small up-turn statistically in farm operators in 2016- demonstrating a need to support a new generation to enter agriculture. WIth a focus on B.C. and Alberta, Young Agrarians coordinates a Grow-A-Farmer Strategy that aggregates resources and opportunities on-line, educational events on and off farms, business mentorships, and land access programming. For more info please visit youngagrarians.org. Despite the recent increase in demand for local, organic food, the Canadian Census of Agriculture shows a decreasing trend in the number of farms in the Kootenays since 2011. These regional declines reflect provincial trends. This highlights the urgent need to increase local food production and economic development, and support agricultural producers across the Columbia Basin. The Kootenays is seeing more and more farms selling directly to the public through farm gate sales and farmers’ markets, with more than a dozen seasonal markets in communities across the region. There are also some local retail champions and restaurants purchasing locally produced foods. There’s clearly a demand: 75% of residents in the Basin-Boundary regions prefer to buy locally-produced food and more than two-thirds would pay extra for local, says a report from the Columbia Basin Trust. Considering that 95% of the food consumed in the Basin-Boundary region is imported from other regions, provinces or countries, there is expansion potential for local producers and processors. Funders: Thank you to the Columbia Basin Trust and the Kootenay & Boundary Farm Advisors for making this event possible!